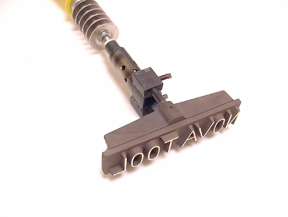 Jet branding iron shown above with solid bronze branding die. 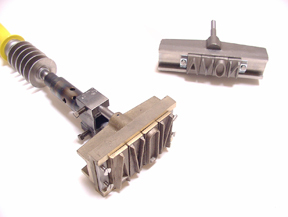 Jet branding iron shown with 2 inch slotted character holder (left) and 1 inch slotted character holder, right. Branding with the Jet branding iron and a solid, cast bronze branding die. Makes a deep, dark, permanent mark that can be painted over and still show. Our Jet branding iron is used extensively by the honey industry for marking bee hives and the construction industry to mark scaffold planks. Also used by the irrigation industry to mark plastic valve boxes. Use for marking tools and equipment too. Can also be fitted with a logo branding die made from your artwork. Simple design and heavy duty construction for years of trouble free service. Available character sizes are 1/4 inch up to 2 inches. Includes burner head, handle, valve and 10' of hose with fitting for propane tank. Branding dies and slotted holders are sold separately. Please note: This branding iron will accept branding dies and slotted character holders made by Everhot Mfg. If you already have an Everhot iron, our branding dies and slotted character holders will fit it and our iron will fit your dies!